Don't forget to launch the reverse engineering once the full project has been imported and compiled by eclipse. If you launch the reverse before the compilation end then the reverse will fail. We recommend mapping all your project information inside your model, btw you can also only use the automatic detection. The XMI Backup menu is available in the Package Explorer by selecting src > Open / Reverse UML > Deep Reverse > XMI Backup. If you don't see your .uml UML superstructure Model file at the root of your project in the Package Explorer then have a look at the Tips and Tricks. If you have no src then just click directly on the package or drag and drop Classifiers inside a class diagram in order to create your model. The model will be composed by package's classifiers which has been created or having dependencies with the reversed package. The reverse of all packages of your project by creating a class diagram for each of them is equivalent to the use of the XMI backup feature. This is a heavy refactoring process which requires 12 minutes on my laptop (intel duo core 2Ghz - ram 2048) for Xerces (large project size composed by over 1 000 classes&Interfaces). This process will map each piece of Java information into a UML 2.2 model. This means that 100% of your Java or JEE project skeleton will be saved. Please note that if you want to save business rules inside your model, then you need to manually reverse each method. This reverse is too heavy to be completed automatically (will require between 12 to 24 hours for xerces) and don't really have any sens to be done for each method. The best approach is to select strategic business rules methods and only reverse these methods. The create a view of your project requires to have java code and use automatic detection. You can click on a package and reverse java code immediately at any any time. Note that only the created diagram represented by the package and classifiers will be saved in the model. Click on the package > Open / Reverse UML > Class Diagram or Class Diagram View will select all classifiers from the package and display the selected view (e.g. inheritance, dependencies, associations and Classifiers with or without compartments). If you look at the model then you will notice that only the selected package classifiers and connectors have been saved in the model. select a package or a classifiers in the package explorer and drop them in a class diagram. 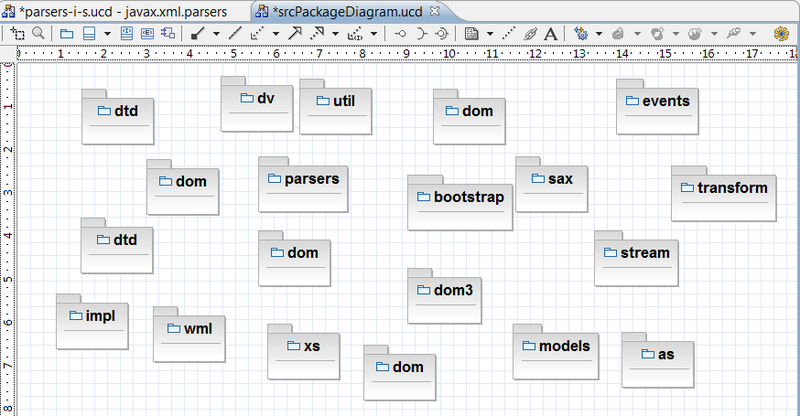 You can create for example an empty package diagram if you select src > New UML Diagram > Package Diagram and drop inside existing packages from the Package Explorer. Please note that the dependencies detection between packages is only activated if you reverse your project at src level (e.g. you can not see dependencies between packages if you don't use src level reverse). The merge option is an important concept if the java project is evolving with the creation of new UML diagrams. The principle is too reverse the full project at the beginning of the modeling stage, then to create diagrams and close EclipseUML. After few weeks of coding another iteration stage is needed. At this stage the model merge will add all detected new packages, classifiers and connectors to the existing model. The merge option is available if you select the src > Open / Reverse UML > Deep Reverse > Merge Model. Existing classifiers and connectors are never erased from the model. Each new package or classifiers are added to the model. Existing Classifiers which doesn't exist anymore in the java code are automatically transform into model classifiers and not deleted from diagrams or from the model. Existing classifiers which are refactored are also immediately renamed/moved in the model and in each UML diagram when you first time open the editor. If attributes or methods are added or deleted or rename then it is immediately mapped with the model (e.g. it means that deleted attributes or methods from the java code are deleted from the model at this stage). Please note that if you copy and paste diagrams into another project then diagrams will not anymore be synchronized with Java or the model. If you move diagrams inside your project then diagrams will keep the same properties and will always be synchronized. JPA annotations are automatically reversed in both live code/model/UML Editor synchronization. You can use deep reverse menus (e.g. XMI backup or Merge Model). The use of the Dali plugin with EclipseUML is required. Dali plugin connect the database and reverse it into Java code including annotations.